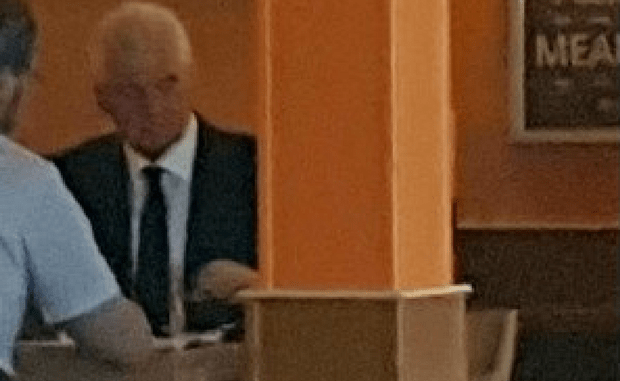 Thanet council insists authority leader Chris Wells has not broken any council protocol after he was spotted having lunch with developer Stone Hill Park’s spokesman Ray Mallon on Wednesday (November 1) – but the incident has been reported to Kent Police by Conservative county councillor Paul Messenger. Photos of the meeting in Broadstairs that surfaced on facebook caused furore among supporters of the campaign to bring aviation back to the Manston site owned by SHP, who said Cllr Wells was in breach of rules designed to prevent lobbying. 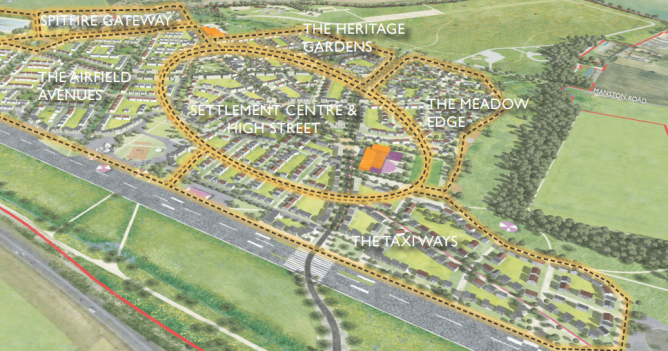 SHP, which owns the Manston airport site, this week submitted a hybrid planning application for 2,500 homes; an advanced manufacturing focused business park; sports and recreational facilities, with the former runway becoming the focal point for a network of parkland, trails and outdoor space, and a ‘heritage hub’ at the site. The new document outlines some changes from the original proposals submitted in 2015. A rival plan by RiverOak Strategic Partners (RSP) aims to reopen the airport site in a £300m project to create an air freight hub with passenger services and business aviation. The company aims to submit an application for a Development Consent Order to the Planning Inspectorate this month to allow a compulsory purchase of the site. It bought out the DCO rights from the original proposing company RiverOak corporation last December. Conservative Kent County Councillor Paul Messenger said: “As a KCC member for Ramsgate division where the majority of my constituents are keen to see aviation return to Manston I find it very strange that Mr Mallon finds the need to meet the UKIP leader in a bar 5 miles away from the TDC offices in Cecil Square without an officer present. Pro-development campaigners have defended the meeting saying Mr Mallon is a spokesman and, as such, holds no decision-making powers. Some have also drawn parallels with Conservative members meeting RSP. Thanet council say no rules were broken. Cllr Messenger has requested an investigation is opened and, after asking for advice from the county council’s legal officer, has reported the incident to Kent Police as a possible offence of misconduct in public office. So let’s get this straight. Mr Mallon is spokesperson for a company who have been trying to get through planning consent on Manston Airport, an updated planning application being submitted on the day he met with Cllr Wells to discuss forward investment into Thanet, and TDC state that this doesn’t break the rules? It would be very interesting to know what forward investment was being discussed…. was it for a wave pool? Only in Thanet could this happen. I agree, Ann. Gross misjudgement of behaviour by Councillor Wells. So, are these meetings allowed to go ahead without an officer present or not? If not, why did it happen? If yes, then why were councillors warned by Monitoring Officer, Tim Howes, not to go to any RiberOak presentations? No win situation Howes is in, if you ask me! Cllr Bayford, on the other hand, spoke on the platform at the recent RSP/SMAa BBQ… and that’s somehow OK? That meeting was open and was filmed for all members of the public to see. Also, Bob Bayford isn’t Leader of TDC and has 1 vote. Wells’s meeting with Mallon was 1 on 1, with no officer present, when there should have been. Wells was said to be discussing land acquisition and “inward investment” with a third party, which I understand is against TDC rules, so is a key issue which shouldn’t be done in private! 3 odd Month’s later, Hey Presto! Bob Bayford is the Leader. What a surprise! I believe this is against the Council Rules and Protocols..
Mr Howes, a senior TDC Officer has made that very clear in the past…. The foolishness of the pro airport group to put photos and timelines of people’s movements on a “closed” Facebook page will open you up to all sort of problems. Mainly libel and a little bit of stalking. It beggars belief that the pro-airport fanatics would waste police time over such an insignificant matter. Moreover, the complaint it blazing hypocrisy when a number of councillors are openly supportive of RSP, have attended meetings with Mr. Freudmann and Mr. Yerrall, and have participated in planning decisions relating to Manston. Where were the complaints when one of the pro-airport councillors had a breakfast meeting with DTD Consult? Chris Wells was ill-advised to have this meeting outside the office if only because it was always likely to be deliberately misconstrued. But he hasn’t done anything wrong and it certainly isn’t a police matter. Whoever made this complaint ought to be prosecuted for wasting police time. Cllr Bayford has no influence with regard to planning at Manston Airport, Cllr Wells does. This save manston bunch really are pushing boundaries. They are on the line of libel and slander and should be extremely careful how they proceed. Regardless either on line on in person it’s against the law. Hope they have the cash to pay the legal bills and compensation that may come their way. Just looking at their Facebook pages it’s amazing how many keyboard warriors there seem to be with nothing better to do. There is no libel or slander in what has been said about Wells’ meeting with the ex-cop Ray Mallon, Steve Davidson. I do wish people who don’t know the law of defamation would stop pronouncing on it. Obviously you haven’t looked st SMAA FB Page recently then. I’m pretty sure you don’t know what I do got a living so don’t guess or assume as it makes you look silly Brenda Martin. Correct, Steve Donaldson, I have no idea what you do for a living. And you don’t know what I do and you don’t know how to spell my name either. It is my opinion, there is no libel in the piece to which I assumed you were referring. If you are a lawyer then you will know that neither of us can be 100% correct as it is up to a court to decide.And juries can be unpredictable. Brendan, Don’t make me laugh. Have a look at the SMAA FB Page. That’s what they do. Please don’t assume that I don’t know about law it might make you look silly. What a lot of rubbish. They are just hypocritical and sound like a bunch of Schoolgirls (Apologies to any real Schoolgirls) having a hissy-fit. Grow up and stop complaining! It was of course also alleged that a similar meeting took place in 2015 without an officer, after which the tone towards RO changed from one of support – as the UKIP electoral pledge to the people of Thanet – to one of derision and contempt. As usual the pro airport groups jump to unproven allegations and statements demonstrating that once again they are in the wrong and waste public money and time . They are so airport obsessed they make so many statements that usually and most often turn out to be incorrect false or lies. The only success these groups have had is to lose 4 years of lost opportunities for job and housing development in Thanet. Actually, East Kent Resident, this is not about airport but about creative development of our area. The lost years relate to fixed agendas in my view, which have shut out any other sustainable, imaginative, viable development, of benefit to residents and visitors. It’s quite odd for Ann Smith to claim that Councillor Bayford has no influence over planning for Manston. 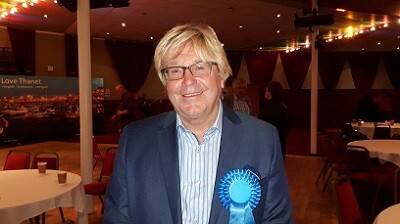 As far as I’m aware, Councillor Bayford is Leader of the Conservative Group on Thanet District Council; a political group which, according to Paul Messenger, is pledged to oppose Stone Hill Park’s plans for the site and the new local plan which would permit redevelopment of the site. I’d say Councillor Bayford has plenty of clout and influence. If it was wrong for Councillor Wells to be having this meeting it was just as wrong for Councillor Bayford to be addressing a meeting of pro-airport campaigners and expressing his opposition to Stone Hill Park’s recently submitted planning application. Anywhere else in the country such conduct would be called predetermination. There is a very important difference, Cheggers, between a public meeting which may relate to party policy, and a private meeting without an officer. That is the nub. There is no difference whatsoever. It was a BBQ and the bit which was filmed is just the bit when they were on stage together. We don’t know what took place when the camera was switched off, just as you don’t know what Wells and Mallon were talking about. Why not be honest and admit that this is just the Conservative party trying to smear the Leader of the council? If we are going to talk about honesty, then we should be told about the content of any private meetings and especially any pledges which would affect future developments, bias or manipulation. That is the nub! The truth of the matter is, we do not know although to some of us, it is writ clear. Nothing to do with party colours I can assure you. You are right Beverly, like al the private meetings that Beau has had with river oak or RSP or what ever they are going to be called this month. Council procedures are subject to rules of engagement, including the risk of predetermination. That is why officers are required to be present where there could be any conflict of interest. Other parties outside council do not have these issues and are free to hold whatever meetings they choose. Steve Davidson. Look up the Oxford English Dictionary and you will see the plural of “jury” is “juries”. I would be delighted for you to explain why you think the posting about Wells and ex-cop Mallon is libellous. I am happy to stand corrected, if you are correct. Apologies about getting your surname wrong. But at least I didn’t exchange your gender as you did me when you wrote Brenda. And pray tell me, are you a lawyer? Brendan, would you like me to post the screen shots of SMAA slanderous comments on here? I am happy to do so. Don’t need a dictionary but you may need a lesson in grammar. You maybe gender neutral, so was trying to ensure that i didn’t offend anyone. Keep smiling princess. Well they shouldn’t post them on FB then. Once they do they do they are in the public domain and I will ensure that the author is credited. They may be in the public domain but I am the one responsible for libel on my site as the publisher. Please do not post them here. Sorry Cathy, your the publisher of this site? Ok will send you the details directly. To the news desk? You have to admire the shameless hypocrisy of councillors, who are implacably opposed to SHP’s plans, whining about the risk of predetermination. We stood [implacably! ], Cheggars, on an airport election ticket for Manston, not housing. By July 2015, two months after the May elections, we were expected to drop RO after months of public support for them. So what happened between the election and July? Some said exactly the word that you have used – predetermination. Some felt that we had been allowed to stand on a false ticket. I don’t know why some people whinge about any Tories being present at any meeting with RiverOak. They don’t need to be lobbied. They have supported RiverOak and Manston Airport from day 1. Does anyone know what was the outcome of the complaint to the police about the Wells/ Mallon meeting? I hope the Kent Police are taking the complaint seriously.